Here, organic farmer Ramasamy Selvam who first met Nammalvar in 1993, talks about his association with this icon of sustainable farming who passed away on December 30, 2013, while leading a campaign against the plan to extract methane gas in Cauvery delta. He was 75. Every politician of note in Tamil Nadu, from Chief Minister J Jayalalithaa to Vaiko of MDMK, mourned his death as “an irreparable loss”. The history of organic farming movement in Tamil Nadu starts with Nammalvar. He always said it is no use trying to teach a farmer. Instead, one should make the farmer understand the issue. He never stopped learning from them himself and had become a vast repository of farming practices and knowledge that he shared with whoever was interested. He never pushed ideas down anyone’s throat. Each farm is unique according to the farmers’ understanding and the conditions, Nammalvar would say. He would keep experimenting with what he learned from the farmers, refined this knowledge and then gave it back to them. One of his sayings was: “Farming is not a way of producing crops to make money. It is a way of living, and a way of living that is possible even in the 21st century.” He trained hundreds of farm youths as trainers and helped many farmers to be master trainers—all this without government support. Nammalvar gave up his trousers and shirt and always dressed in a simple way, wearing the same kind of clothes the farmers wore. Sometimes when he would arrive, dirty with travel, someone would give him a new set of clothes and get the old ones washed and ready for his next visit. He learned to speak simply, too, so that he got his message across. Simple sentences with Tamil proverbs, telling real stories that touched the heart of his listeners. He could keep scientists and agriculture experts also spellbound. He travelled extensively and spent most nights in buses. One evening Nammalvar suddenly asked: “What would you like written on your graves?” All of us said different things. When his turn came, he took a little time and then said: “This is what I want written. ‘Here sleeps peacefully a man who disturbed some people’s sleep’.” Yes, he now sleeps after rousing thousands from their sleep. He made his whole life a mission of speaking about the ills of chemical farming and the need for organic farming for nearly four decades. 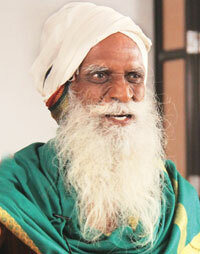 Once a reporter asked, early in Nammalvar’s crusade, if he was sure farmers would switch to or ganic. He replied: “I don’t mind if they do not change now. My work is to tell the truth and sow the seeds. Some seeds germinate quickly if the field is good. Others will take weeks and some will take years. I am sure my seeds are good seeds and will germinate surely even after decades.” That has happened. As a result, almost all the political parties have listed support to organic farming in their election manifesto. This silent revolution was sown by him. The last time I met him was on December 29 at a book release function in Thanjavur. He was very weak so we all pleaded with him not speak. But he refused and said people were there to listen to me. He spoke for more than an hour. After the meeting we urged him to rest for a few days. But he was insistent on continuing his campaign against the gas project in the Cauvery delta. He died the next day in a hamlet called Pisini near Atthipatti in Pattukkotai block. He leaves a vacuum that none can fill. Wishing a peacefull sleep for such a great soul. My tributes to the senior colleague, who followed his dreams with conviction. Dr.G Nammalvar, the agriculture scientist who pioneered organic farming movement in Tamil Nadu was a great scent and a great soul.I listened to his talk at IIM truchy. Nammalvar said the truth.. Now it's time to implement what he said.. May his soul rest in peace..
Hello Sir, I want to join with your green revolution. and I like to do something to my city. please inform and update your revolution process.